I get invited to lots of places to speak, but my favorite locations are schools. The bright young minds of kids who ask great questions keep me young, despite my 91 years. Students Katie and Sophia show their nesting boxes. Behind them, from left, are Michelle van Hilten, program administrator for Think Wild, and Anne-Marie Eklund, science teacher at Cascades Academy. A recent Monday morning, found me in the classroom of Anne-Marie Eklund at Cascades Academy in Tumalo. We were joined by Michelle van Hilten, program administrator of Think Wild. 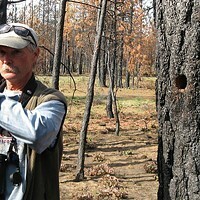 The topic of discussion: Human/wildlife interaction—Think Wild's primary area of interest. Think Wild's new/old facility, starting up on the east side of Bend, will—beginning in the spring, according to its website—provide a full wildlife support system and wildlife animal hospital for all of Central Oregon. In the meantime, van Hilten is going from school to school with various educational tools, introducing students to an ecological approach to wildlife needs. During my visit, I told a few stories about my early days of growing up on a farm in Connecticut, including the time I shot a Great Horned Owl, and my grandfather's reaction to this misdeed. In that discussion with my grandfather, I learned lifelong rules and the values of wildlife conservation. During the recent school visit, I shared those values with the students. In addition, van Hilten led a discussion about the need for wildlife corridors to eliminate conflicts between humans and migrating wildlife, such as mule deer. 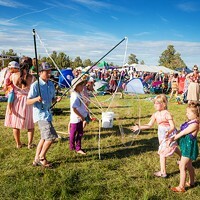 Curriculum and lessons for the school's "Think Wild Week" were a combination of Project Wild K-12 curriculum and data, Leave No Trace education and National Wildlife Federation education programs. The week was geared toward environmental science and conservation initiatives, including lessons which cover science, social studies, language arts, visual arts and math. It was a full-spectrum approach to learning. The Think Wild facility also made it possible for the students to travel to the High Desert Museum and discuss wildlife diversity with museum staff. 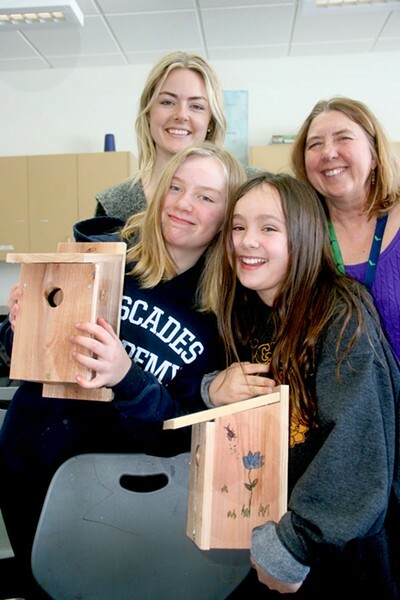 After returning to school, students took on the task of assembling several nesting boxes that will be installed in locations where they will hopefully be used by the mountain chickadees found around Cascades Academy. But the nesting box project wasn't "just" about building a structure for birds. As soon as one box was done, two students took it aside and used it as a base for creative art. While maintaining and reinforcing the original intent of the structure, students added art forms that made it fit in better with the natural environment. It was a delight to see. The students who took part in these programs not only learned about their wildlife neighbors, but also had the opportunity to express their thoughts, using their own art talents, with the help of community members who have "been there, done that." Teacher Eklund noted, "It is very satisfying for me to have the opportunity to work with these students on wildlife issues. These students are ready to make a positive difference in the world, and by focusing on important wildlife issues in Central Oregon, the kids are able to use this knowledge to make a real difference!" 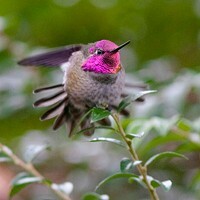 In all the years I have been dealing with nature and kids, I'm always so pleased when the Big Picture comes into focus in a child's mind, and he or she says (or sends me a slam-bang beautiful photo) of a unique moment in nature, "Hey Mr. Anderson (circa 1965) or Jim (circa 2019), how about this?"